Several months ago I was browsing Instagram and found these cute little breast cancer awareness minions by NailStorming (Gianna's got some amazing designs!). I thought they were such a good idea, and made a note to make a Christmas version when December rolled around. Sure enough, here they are - my first Christmas nail design of 2014. The tutorial for these went live on Wednesday (a bonus video for this week) and since then I've been desperately wanting to watch Despicable Me. I haven't managed to find it yet in the DVD collection of the place we're house-sitting, but it still could be in there somewhere... fingers crossed! Please subscribe to my channel ☺. I've made a video for minion nails before, which you can watch here - it's an older one though. You can also see my very first attempt at minion nails here, from over two years ago! I'll give a short explanation of each nail. The thumb is based off this picture; I wanted to do something a little different on the thumb, rather than just another minion. I ended up being really happy with these Christmas lights. The rest of them were designs I scribbled on a piece of paper before painting. As you can see, the Santa minion is on the middle finger, and there's an elf in on the ring finger. 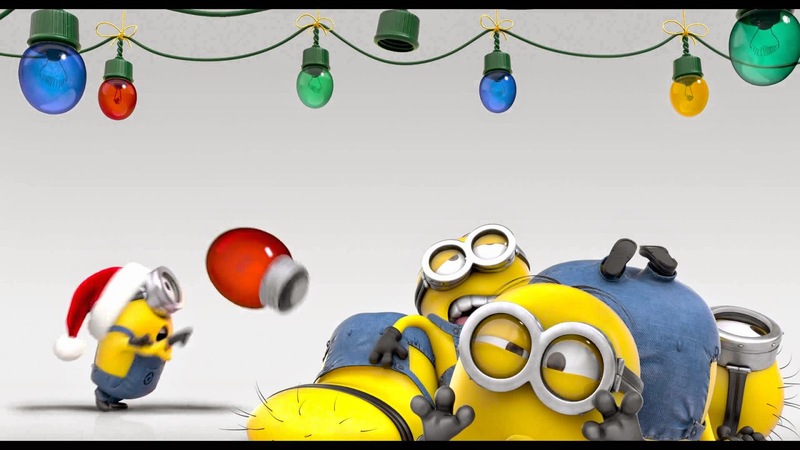 The index and pinky are two normal blue-suited minions, but still a bit festive with a candy cane on the front of their jumpsuits. I must say, while these are cute I'm not 100% happy with them. The yellow isn't quite the right shade, and the silver googles are hard to see. And minion mouths have always been a challenge for me - especially when you're painting at an unnatural angle in order to get them in camera! Things to work on next time, I suppose. Hope you like these anyway! I've just uploaded a new video, and the blog post for that will be up soon. In the meantime, check the tutorial out here! These are so cute and happy looking!